Bask in our Summer Revived Body Lotion and treat yourself to that holiday glow all year round. We gathered together the people who know skin and the people who know beauty and came up with Cell-Moisturisers - key moisturizing actives compressed from natural seed oils. We then combined this for the first time with natural tanners, creating a pampering self tanning lotion that leaves skin glowing and full of moisture. Enjoy smooth, moisturized skin with a natural looking tan. Smooth on sunshine with Dove Summer Revived, our moisturizer with a touch of self-tanner, to leave skin with a summer glow that builds over time, as well as looking and feeling cared for. Want to know a secret? You don’t actually need summer for your skin to get a summer glow. Well, OK, self tanner isn’t exactly beauty’s best-kept secret, but there’s no doubt that the best (and easiest) glow is the one that comes from a bottle. So how do you keep this sun-kissed look all-year round? With the best self-tanner. For the best application, moisturizing is key, but that’s even easier when your self tan lotion already is a body moisturizer. 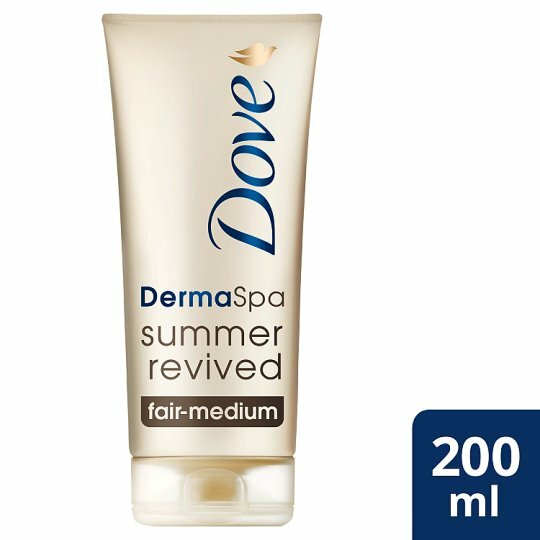 Try a gradual tan moisturizer such as Dove Summer Revived Body Lotion, with two shades to match more skin tones. Use sweeping, circular movements to rub in your tanning lotion and try to give it at least half an hour to sink in before you get dressed for a nice, even finish. Voila: glowing, sun-kissed skin, whatever the weather.